WEST LAFAYETTE, Ind. 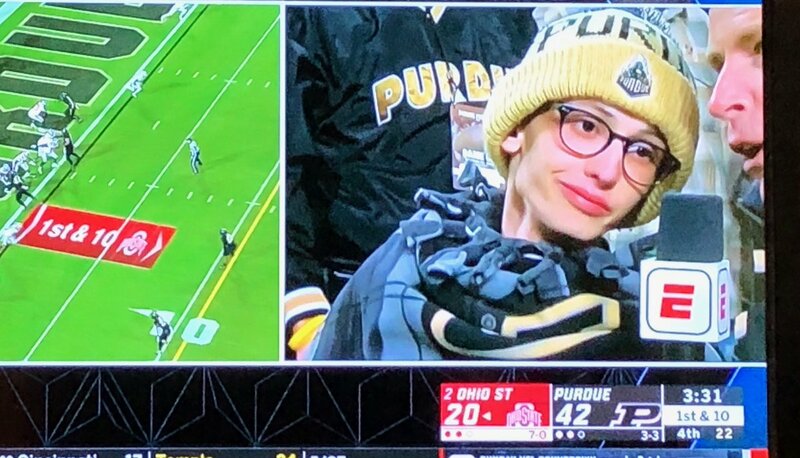 –In a night filled with swirling winds and chilly temperatures, the Purdue football team found a way ignore the weather elements and heat up their offense and crush the number two college football team in the nation, Ohio State, with a resounding 49 – 20 win at Ross- Ade Stadium Saturday night. For Purdue Coach Jeff Brohm in his 20th game as head coach, his team took the lead late in the 1st quarter and never looked back, rolling up to a 14 – 3 halftime lead before blowing the game wide open with three D.J. Knox touchdown runs spread out between the 3rd and 4th quarters. Saturday’s game had Purdue scoring the most points ever against the Buckeyes and the second-largest win in school history over Ohio State and its first win over a top-five-ranked opponent in 19 years. Purdue upped their record to 4- 3 and will take on Michigan State this Saturday while Ohio State had their undefeated season end with Saturday night’s loss as their record now stands at 7 -1.